For the opening of the Sound of Silence Festival on February 24th 2017 at De Nieuwe Regents Theater (DNR), iii debuted a multimedia performance inspired by Benjamin Christensen’s silent film Häxan: Witchcraft Through the Ages. 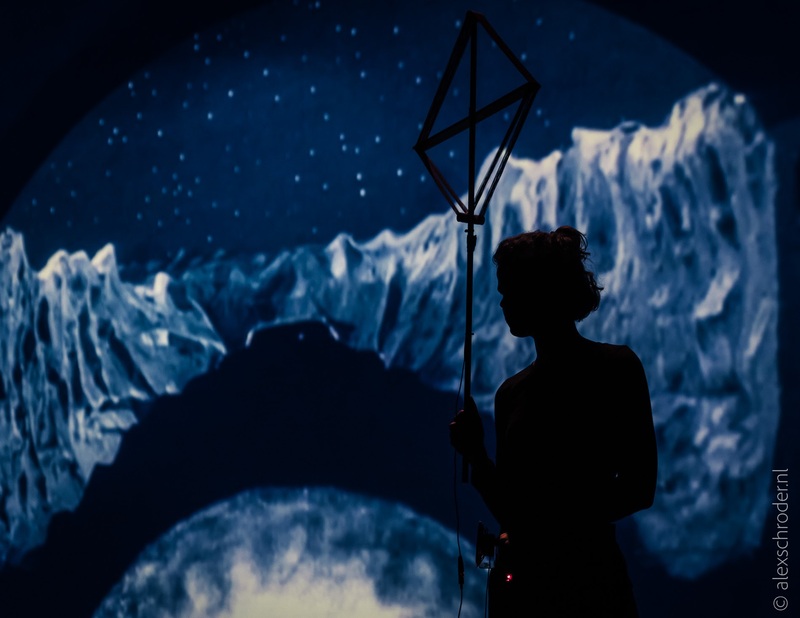 In this article, we discuss our approach to reworking the format of a silent film screening accompanied by live music, and share our methodology and process in collaboratively producing a live performance based on a work for fixed media. Here is an abbreviated version of the film from 1968 accompanied by the narrating voice of William Burroughs and a score by Daniel Humair. The film was particularly fitting for us as our programmatic theme for 2017 has been “Prototyping New Rituals”. We also found the film relevant in the way it depicted the scapegoating and repression of women throughout history, a phenomenon that remains to this day. This resonated with our concern for a gender issue that touches us more closely, that of the under-representation of women in the field of art and technology. 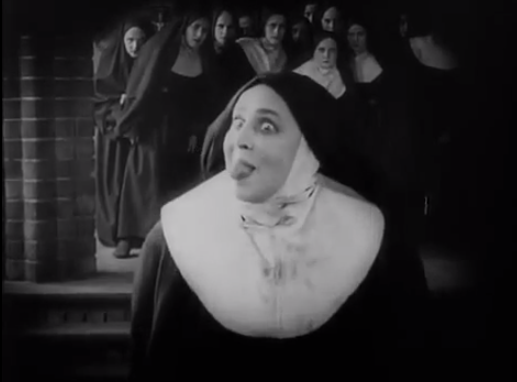 The main question at the beginning of this project was how to break out of the conventional live-soundtrack-accompanying-silent-film format. We decided not to show the entire film, but to recreate a narrative using only a few short fragments from it, and express its themes through our own autonomous work. The fragments of the film that we chose to show were primarily the didactic sequences illustrating the historical source material on which the film is based. In the initial sequence these consist of both found images and highly compelling original visual material describing ancient and medieval cosmologies in connection to magic and witchcraft. We also chose to show the final sequence concerning modern notions of mental illness and hysteria. The rest of the movie, which consists of dramatizations of short episodes situated in different historical periods, we chose instead to cut out, replacing it with our own material. The production also presented us with the stimulating challenge of integrating our different working methods into one narrative. Although we often present immersive performances as a group, these are usually formed from a number of independent pieces placed in sequence, in which each artist has full control over their own individual performance. In this case, we went further into the collaborative process, involving each maker and performer’s input, and organizing these ideas in an overall score put together by Lars Kynde and Wen Chin Fu. How to organise our work collaboratively within iii is a question that we address continuously. Finding the balance between individual autonomy and cooperation is an ongoing process which finds differing incarnations within individual productions. Each production is led by a project manager, who is responsible for both coordinating the contributions of each member of the project team, as well as of maintaining relations with external parties, such as presentations partners and funders. In past projects such as Rites for a New Utopia we combined a sequence of autonomous works within an overarching meta-composition. But we have long held the desire to go beyond this, and operate in a way comparable to a theatre company. For the production of Häxan, Wen Chin Fu volunteered to take the role of project manager, as she was interested in leading this project in parallel to her master studies in music theatre at TIME. In hindsight, her role in the project was comparable to that of the director, even though she resists the definition. She ultimately was responsible for finalizing decisions, although these were generally discussed together with the team, unless time pressure forced otherwise. Lars Kynde took the role of the composer, which he carried out by listening to the ideas of the group, and formalising them in a score, as an aid for the performers. Mariska de Groot and Dewi de Vree focused more on their own individual segment of the performance. We quickly realized that there weren’t enough of us to stage the production and decided to involve a group of female performers from the TIME program at the Royal Conservatory of The Hague (Chandana Sarma, Liesbeth Vreeburg, Julie Kurries, Marie Pien, Myrthe Boersma), most of whom actors or musicians, as well as long standing collaborators Ludmila Rodrigues and Mei-Yi Lee. It’s important for us to note that the performers were all female, as it resonates with the gender element of the film. For the production of Häxan we selected several instruments developed for previous work. This was due both for the interest of exploring new possibilities with instruments and techniques already at our disposal, as well as to make the most of stringent time and budget limitations. 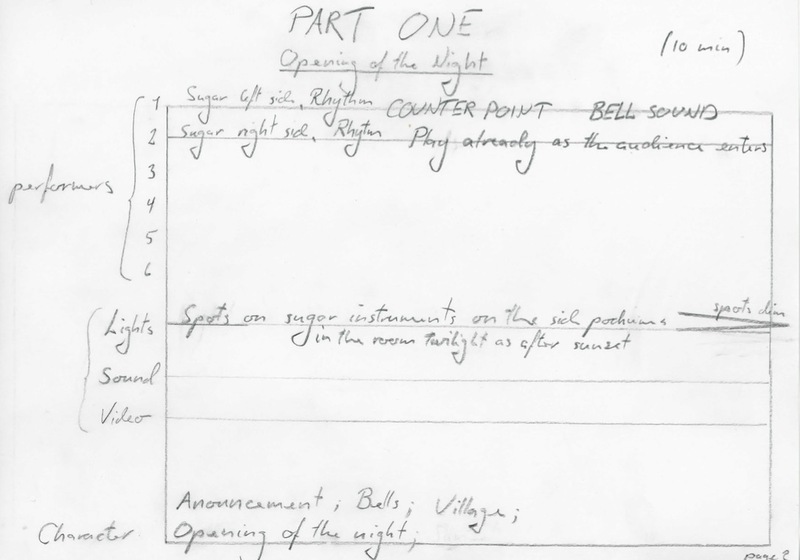 We began by structuring pieces around each instrument before integrating them into a storyline following the narrative of the film. 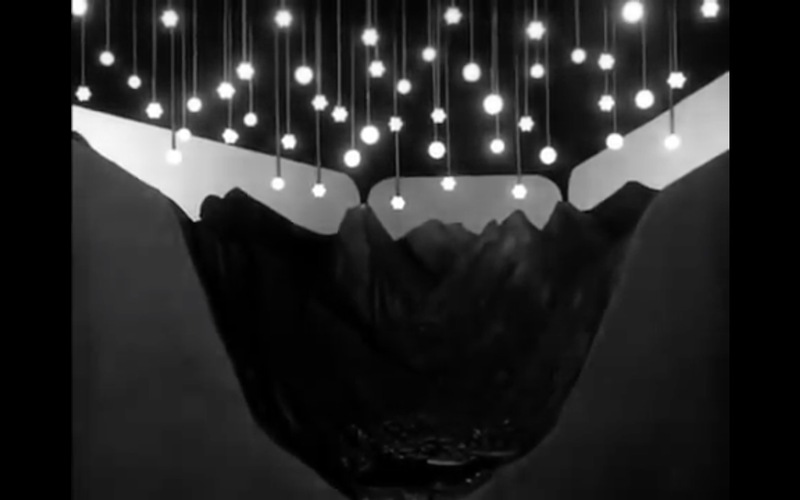 Each fragment of the projected film was followed by a performance with one of the instruments. 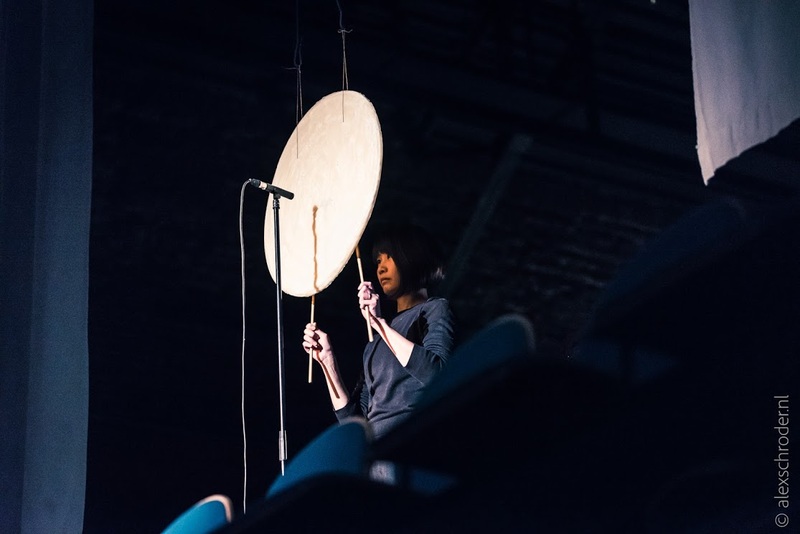 The structure of the whole performance followed one night of a witches’ sabbath, from dusk to dawn, announced by the sugar instruments of Wen Chin Fu. We connected the recurring image in the film of women mixing brews in cauldrons, to the process Wen Chin takes when melting and turning molten sugar into crystallized plates. These large idiophones were played with mallets by percussionist Mei-yi Lee. Moving the mallets across the surface of the idiophones produced different overtones over time. The sugar starts cracking as it is being played, affecting its resonant properties. Dewi de Vree’s instruments consisted in copper wire antennae spun over long wooden crosses and connected to mobile loudspeakers, a design developed from a previous instrument made with Matteo Marangoni. These antennae were used to convert oscillations in the electromagnetic spectrum into sound: “energy from the ether”. 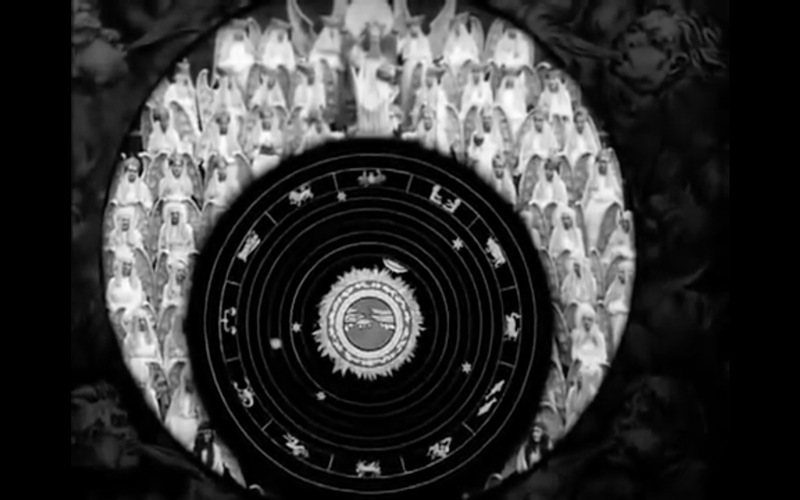 It was associated with an illustration of the angelic circles of heaven taken from the initial sequence of the film. Another recurring element in the film was the transformation of the human body by means of magic. 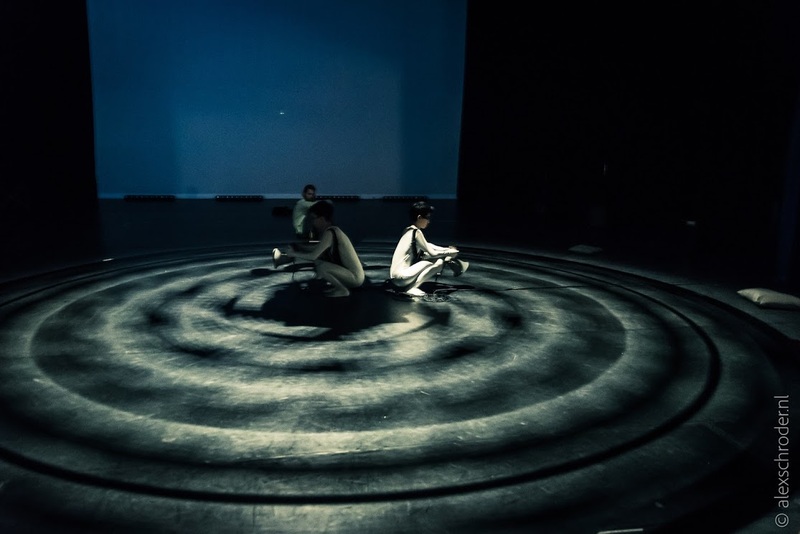 This was associated with Wen Chin Fu’s performance “Spine Spinning”. In the darkness two performers crawled around the audience in crackling black leather suits fitted with lights highlighting the reptilian movement of the human spine. 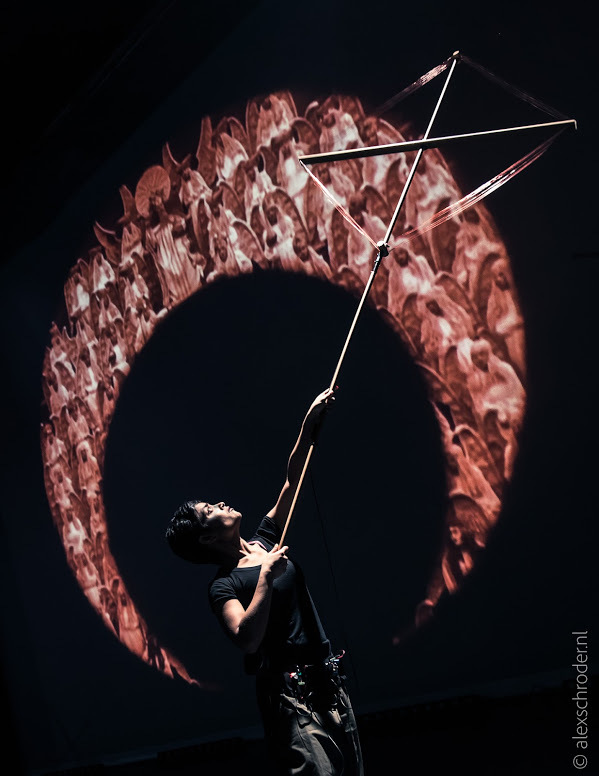 Mariska de Groot created a new hybrid instrument combining optical sound techniques already employed in Shadow Puppet and Nibiru, together with the spatial projection technique used by Matteo Marangoni in City Sondols and Echo Moire. Mariska’s instrument projected light from the ceiling to the floor and through a large rotating disk engraved with perforated patterns, creating a moving interplay of shadow and light. The light intensity was further modulated by Mariska using an analogue synth. 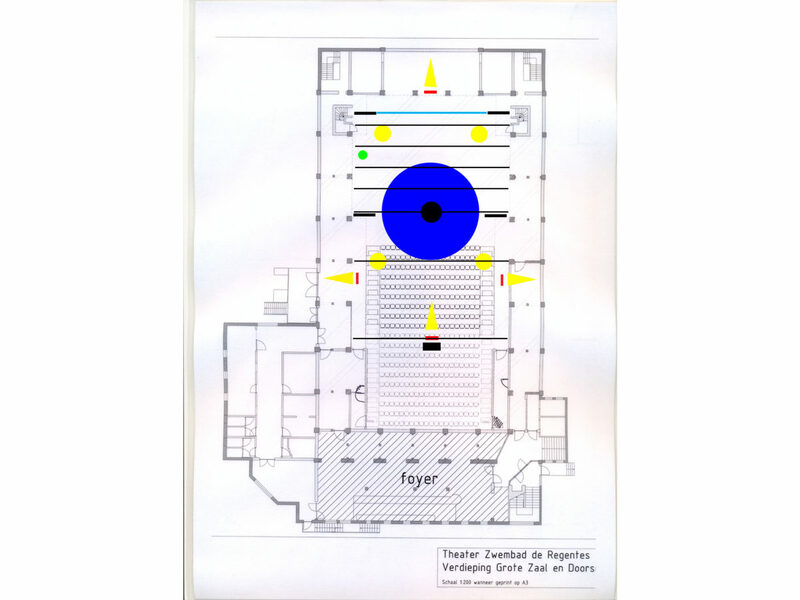 Meanwhile, two performers wearing white lycra suits moved within the light projection wielding loudspeaker horns connected to photocells. These instruments converted the projected light into sound. The sounds were siren-like and very much “in your face”, contrasting with the slender physique and graceful movements of the performers. Since we usually perform with the instruments that we create ourselves, it was a new experience to have our instruments performed by others. As Mariska noted, “it’s interesting to put something out into the world and get something else back.” Each performer brought something new to the instruments, in their presence, their interpretations, and their creative inputs. One particularly powerful moment was in the performance with the hybrid instrument created by Mariska. While the reflection on gender issues was not central in our minds during the production, in hindsight the choice of focusing on the witches’ sabbath (a nocturnal escape from the daily order), together with the choice of excluding most of the original material, could also be seen as a rejection of Benjamin Christensen portrayal of witchcraft as a series of superstitious beliefs connected to the scapegoating of women, in favour of a positive view of magic and ritual as a vehicle for empowerment and self-realisation. It was an interesting challenge for us to work more as an ensemble. We weren’t completely satisfied with how this resulted in the whole structure of the work, and there remains a sense that the piece lacks a clear ownership. The group dynamic during the production exemplified how, even when there is a desire to share responsibilities and take decisions collectively, in practice not everyone has the time and energy to keep an overview on the project. This factor, together with the reluctance of Wen Chin in taking a clear directing role, in several occasions was source of confusions and conflicts. However we feel that this chaotic dynamism ultimately was fertile in generating a powerful result. We thank Amir Vodka of Sounds of Silence for the opportunity to realise this project with such freedom, and all the performers for embracing it and showing us what we did not expect. This article was written by Ingrid Lee and Matteo Marangoni based on conversations with Wen Chin Fu, Lars Kynde and Mariska de Groot. Although we chose to write in the first person plural, this article might not fully reflect the individual opinions of each one of the makers involved in this project.